LEXINGTON, Ky. (March 6, 2019) — Spring Break originated in the late 1920s in Fort Lauderdale, Florida, by a swimming coach at Colgate University. Over time, the American tradition has grown into a phenomenon where thousands of college-aged students escape to sunny and far-away locales. Despite its innocent origins, spring breakers often engage in excessive and risky behavior. Binge drinking skyrockets during Spring Break with 44 percent of college women and 75 percent of college men getting drunk daily according to the U.S. National Institute on Alcohol Abuse and Alcoholism. To help ensure an enjoyable Spring Break, the University of Kentucky Police Department urges use of the following safety tips. Obtain consent, which is an affirmative, ongoing, mutually understood yes. If going out of the country: be aware of travel alerts, know the laws, and make copies of your ID, medical insurance and passport. Avoid using your own bank debit card. If driving: do a maintenance check of your vehicle, have a valid driver’s license, current vehicle registration and proof of insurance. Purchase re-loadable credit cards that are not tied to your banking account. Carry a combination of cash and a re-loadable credit card. Stay between the 2nd and 6th floors of a hotel. First floors are susceptible to intruders, and fire ladders can’t reach past the 6th floor. Stay away from large, drunken crowds. There is a high risk of assault and sexual abuse in the middle of them. Have a code word or signal to let your friends know you are in an uncomfortable situation. Always stay with your friends and leave with your friends. Take care of your health: stay hydrated, practice sun safety and don’t skip meals. Lock up all valuables, balcony doors and hotel doors. Put away electronic distractions and pay attention to things around you. Make eye contact and project confidence to others. Make mental notes of fire exits and stairwells. Download the LiveSafe app, and utilize the SafeWalk feature with friends to ensure a safe arrival. Contact the nearest 9-1-1 location through Emergency Options. If you need help, ask for it. Call 9-1-1 immediately if you suspect alcohol poisoning. Symptoms include confusion, vomiting, seizures, slow or irregular breathing, blue-tinged or pale skin, hypothermia or unconsciousness. 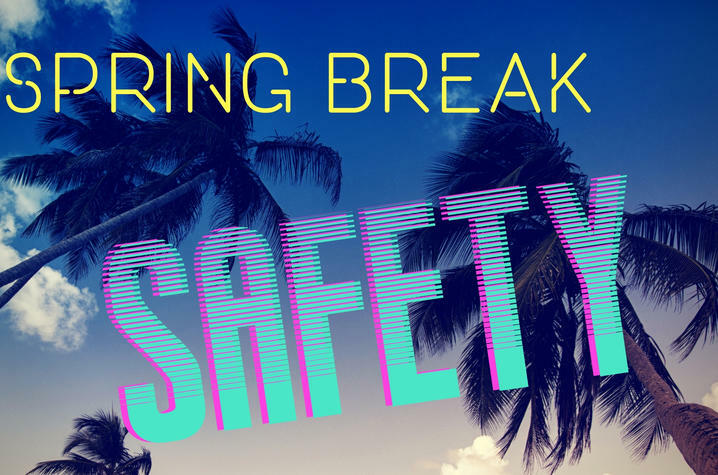 Don’t share too much information on social media: adjust your privacy settings and be cautious about revealing personal information and specifics while on Spring Break. Don’t partake in risky behavior: never leave drinks unattended, don’t accept drinks from strangers, don’t drink to excess and never get behind the wheel when drinking.